There is a long list of skiers and snowboarders who learned the sport at Coppervale Ski Area, beginning with lessons near the lodge before advancing to the tow rope to hone their skills on a gentle slope under the guidance of Mac McCormick. He volunteered as the tow rope operator at Coppervale for 20 years until his recent death at age 85. To honor his years of service, a special dedication ceremony was held Saturday, March 30 for the Mac McCormick Memorial Tow Rope. McCormick would encourage each novice and keep them on the beginner’s slope until they could successfully ride the Poma surface lift to the top of the mountain to access advanced runs. “Sometimes it would be one afternoon and sometimes a couple of weekends,” his wife, Pat, recalled. “He was so proud of every person he could get to the Poma, it brought him great joy,” said Debbie Wilson, a volunteer and wife of Norm Wilson, manager of Coppervale. However no matter the length of time it took to achieve mastery, he assisted them until they made it. He would wrap each beginner’s gloves with duct tape, because the friction of the rope tow lift would create holes in the fabric, and then oversee the loading of the tow all the while observing the progress of each skier or snowboarder. It didn’t matter how busy the beginner’s hill was for he was skilled at his job. This winter he kept the tow rope running smoothly during a school fieldtrip helping 36 students. “I don’t know how many thousands of people Mac picked up off the snow and put back on their feet,” said Norm Wilson, manager of Coppervale Ski Area. 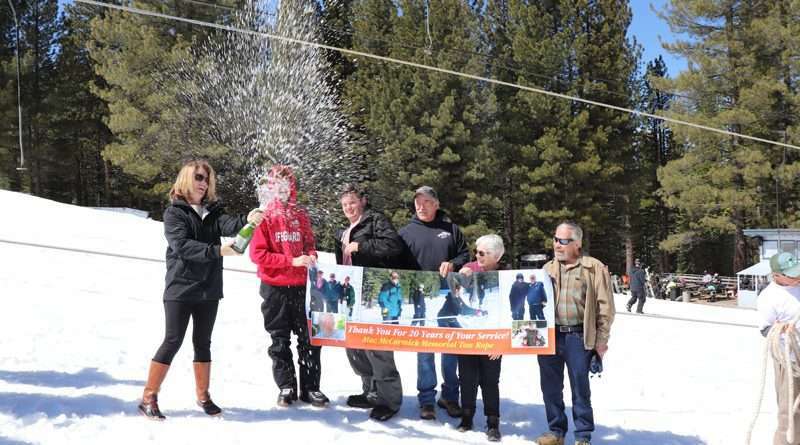 During the dedication ceremony, Mike Klimek, of Chester, said he would not have been able to get his young children up the tow rope to teach them to snowboard without the help of McCormick. Although the children are now well past the beginner’s stage, the family still has several pairs of gloves stored in the garage with duct tape on them. 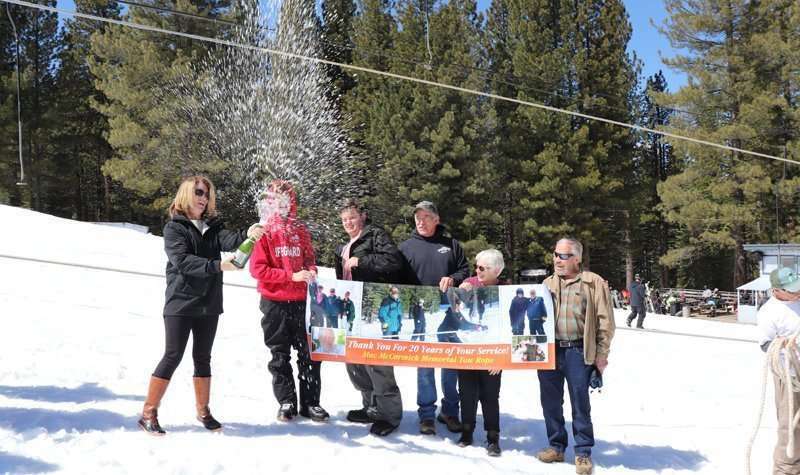 Stan Bales, of Susanville, said his son, Brian, learned to ski at Coppervale assisted at the rope tow and now works in the ski industry. His son worked with Clint Lunde, founder of SkiDUCK at Squaw Valley, to obtain 100 pairs of skis and boots and 40 snowboards for Coppervale so local youth could learn the sport. SkiDUCK is a nonprofit organization that helps disadvantaged and financially underprivileged youth learn to ski and snowboard. McCormick began volunteering at Coppervale after accompanying his daughter, Lisa Boettger, when she took his grandchildren to the ski hill on their visits to Westwood. Wilson said volunteers are greatly valued at Coppervale because the ski area doesn’t have a lot of money and therefore relies on volunteers to operate. At age 73, McCormick decided to learn to snowboard. He picked up the sport quickly because he had watched so many beginners from the vantage point of the tow rope. According to Boettger, he was very proud of that accomplishment. A variety of people attended the dedication ceremony. In addition to his wife and daughter, family members were grandsons Austin and Jared Boettger, son Ken McCormick and his wife Jody. Close friends were Frank Murray and neighbor Mary Hasselwander and her daughters Gina Hasselwander and Jenny Alton. Petra Finks, who oversees the Coppervale Facebook page, also attended and posted the ceremony. “My dad loved the hill,” said Boettger.